Both types consist essentially of PET. To permit their “equivalent-product”, i.e., horizontal recycling, it is necessary, however, to extract the two recyclables from the total flow of waste and separate them into the most homogenous fractions possible. Both PET bottles and PET trays can be recovered as highly useful feed materials. Separation of the bottles and the trays is necessary during the recycling process, due to the differing chemical properties (such as melting point, for example) of the PET used for their production, however, a high-purity PET-bottle sorting product must be achieved to permit efficient recycling of the PET bottle material. This is now also an insistent demand from the recycling industry. As Casper van den Dungen, Plastics Recyclers Europe PET Chairman, notes “Trays and bottles are two different types of product which cannot be recycled in the same recycling line. Their designs and chemical compositions are not the same, and can create quality problems for existing PET recyclers” . PET fractions of grades 90/10 and better, in particular, trade at high prices on the plastics market. In view of these boundary conditions, and against the background of a specific project, STEINERT, based in Cologne/Germany, within the STEINERT Group, began work on the solution of this challenge. 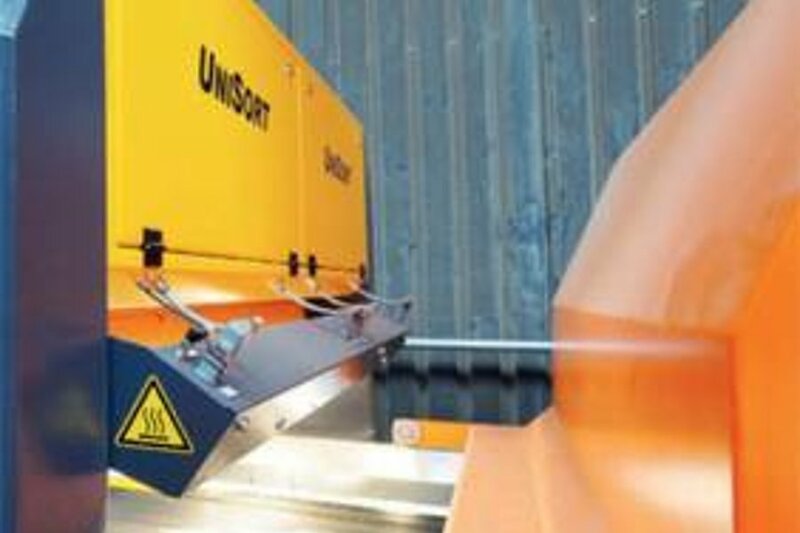 The company, a specialist in the field of magnetic separation and sensor-based sorting with more than 125 years of experience, was able to make use for this of its own NIR-sorter UniSort PR incorporating Hyper Spectral Imaging (HSI) technology. Air separators, which sort on the basis of the geometry and weight of the materials, and also of their differing flight trajectories, have been used up to now, among other technologies, for the separation of bottles and trays. There is, however, an increasing trend toward the use of ever less plastic in the production of PET bottles, with the result that the bottles themselves are then thinner and lighter. This, however, has implications for air-separator-based sorting. Such sorting can be achieved using HSI technology, however. The innovation here can be found in the high- resolution (HSI) camera technology used and in the software-based differentiation between various types of PET packaging and plastics. “We orientate ourselves around the changing market. The quality of the sorted PET bottles product has been declining since PET bottles started becoming ever thinner-walled and behaving like PET trays in the air separator. This was the starting point for our development work. Together with our customers we evolved a solution for the separation of PET bottles and PET trays, in the form of our Hyper Spectral Imaging technology. This solution now enables our customers to produce a high-quality marketable quality and to enhance the cost-efficiency of their process at the same time”, Patrick Lindweiler, Business Development Manager STEINERT, sums up. So how does separation take place? Spectra in the near-infrared (NIR) range are recorded and analysed in order to differentiate between the various types of plastic material. 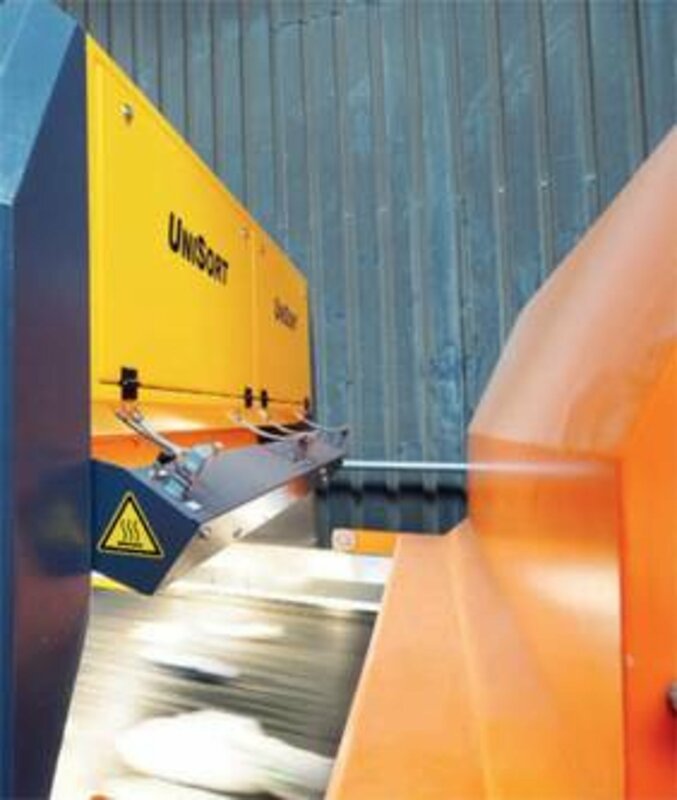 STEINERT uses HSI technology to boost resolution, and thus the accuracy of sorting. Hyper Spectral Imaging technology dispenses with mechanical moving parts – the entire width of the belt conveyor is continuously scanned by a high-resolution line camera. The result is a high resolution spatial NIR spectrum of the scanned plastics, permitting an extremely detailed analysis of their materials properties. This technology evaluates more than 27 million detection indications of the scanned material per second. The sensor module itself consists of the core element, the sensor unit, which is mounted above the acceleration belt. The side elements, which also support the sensor system, house the air-conditioning unit, the entire control system for the sorter, and the operating panel. The control system also triggers the pulses of compressed air from the nozzle bar, which separate the feed material into two different products. The registration of high-resolution NIR spectra makes it possible to differentiate between PET bottles and PET trays on the basis of extremely slight differences in their spectra. As Simon Jansen, Application Specialist at STEINERT, explains: “The camera registers the absorption and reflection of near-infrared radiation. Depending on the arrangement and grouping of their molecules, certain frequencies and wavelength ranges are more greatly absorbed, and others more greatly reflected, as a result of the natural vibration of the molecules. Our HSI technology thus enables us to separate PET bottles from PET trays. We performed trials at our Test Center in Cologne. Adjustment of software-assisted evaluation enables the technology to detect the spectral differences caused by marginal material variations.” As a result of the new requirements and the new technological solutions, SUEZ Recycling and Recovery Netherlands (formerly SITA) awarded the contract for an NIR sorter incorporating HSI technology for sorting of PET bottles and PET trays to STEINERT Elektromagnetbau GmbH. SUEZ Recycling Services’ plant in Rotterdam had already commissioned Line 1 as long ago as 2011. This is used for the separation of plastic film, PET, PP, iron, aluminium, beverage packaging and a mixed fraction. Increasing volumes of waste led to the installation of Line 2 in the course of 2015, and its commissioning in August 2015. In order to improve the quality of sorting for the PET-containing materials, the entire PET product, consisting of both variants, is routed to the UniSort PR with its HSI technology, thus separating the PET bottles from the PET trays. The recovery editorial team visited the site to see the new recycling machine in action and to learn from Thierry Vanovermeire, Project Manager at SUEZ Recycling and Recovery more about the commissioning of the new line, the expansion of the sorting concept to include sorting of PET bottles and trays, and the benefits of the UniSort PR machine. Why was it necessary to install a second line? Thierry Vanovermeire: SUEZ was recently awarded two of the largest contracts in the history of plastics sorting in the Netherlands. Starting in January 2015, a total of over 100 000 t of plastic packaging materials are to be sorted annually. Ultimate throughput is to be 350 t/day, with PET bottles making up 6 to 7 % of this amount. The ratio of bottles to trays in the feed material is 60 % to 40 %. Why did you choose HSI technology from STEINERT? Thierry Vanovermeire: During the past four years, we had gained experience with Line 1, where sorting is conducted using an air separator to sort bottles from trays. The air separator achieved results of 75 % for separation efficiency, in other words, the bottle fraction had a purity of 75 %, but we were looking for a product with 90 % purity. We therefore began looking for a new, and different, technology that would enable us to achieve better separation. We performed tests aimed at achieving better separation using the air separator, on the one hand, and we also conducted a number of other tests jointly with STEINERT at their Test Center in Cologne, using HSI technology. The results of HSI sorting were very promising, which is why we ultimately chose this solution. Why did you need to improve sorting, and the sorting of PET bottles and trays, in particular? Thierry Vanovermeire: The recyclers want the purest possible fractions. Plastic film, PE, PET, PP, aluminium, iron, beverage packaging and a mixed fraction are removed before the materials are fed to HSI sorting. PET is removed as a mixture of bottles and trays in a first NIR detection stage, but this system is not able to differentiate between bottles and trays. Instead of being fed to the air separator, this fraction is routed to the UniSort PR sorting system, which separates the PET bottles and PET trays from each other. Our ultimate aim is ever better recycling! If greater purity for the PET bottles and PET trays fractions means that the PET can be used better, then that’s the way we want to go. We are known for our top-quality recycling.